The energy system is experiencing fast change, both in Europe and around the world. Modern IT solutions offer a myriad of opportunities to make energy production and consumption more efficient and to improve the smart management of energy systems. Elering aims to develop an energetics-centric IT infrastructure in cooperation with its partners that would offer all interested parties the chance for the development, marketing and use of smart solutions. 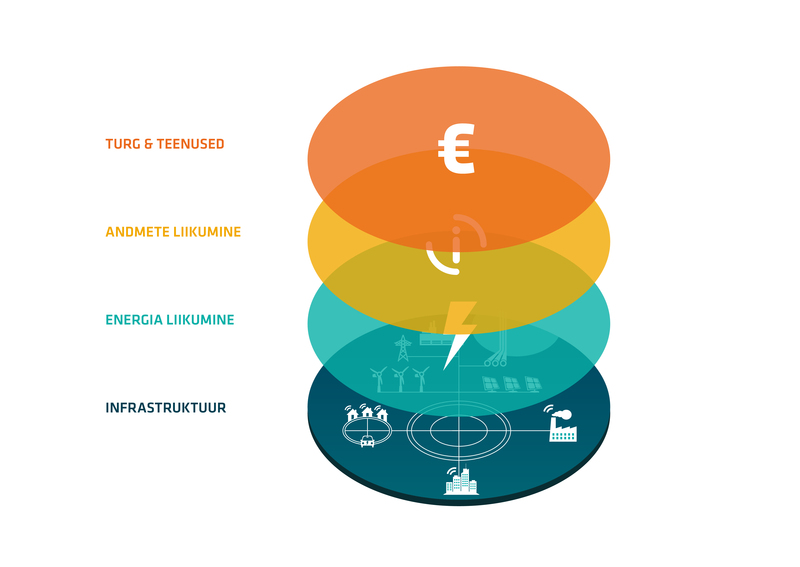 Significant influential trends in the energy sector include the integration of energy markets (single European energy market), the massive addition of geographically dispersed facilities with unplanned production cycles to the energy system, growing accumulation and consumption management options, climate politics and energy efficiency objectives, the addition of new types of market participants (ESCOs or energy service companies, energy cooperatives, aggregators, virtual power plants), the increased awareness of energy users and demand for new types of services, and the loss of boundaries between the energy, gas and heating markets. All this means increasingly more unexpected energy flows, but also exponentially growing information flows in the energy system. Energy network management must adapt to the new circumstances, and networks must become smarter. The smart grid entails combined changes in the energy system resulting from the widespread deployment of information and communication technologies. It allows new services to be offered to consumers. People need neither electricity nor gas, rather heating and light with affordable energy bills. Therefore, efficiency needs to be found in the network and market access must be guaranteed for those market participants who want to offer this efficiency. The cheapest, surest, greenest energy is unused energy! This sets out the energy transmission system operator’s choice of how to manage a changing and much smarter energy system. In order to guide the energy system’s transformation, Elering has created a network of companies to develop a smart software platform. The platform allows end consumers, energy service providers, scattered (small) producers and network operators to increase energy production, transportation and consumption efficiency with the help of near real-time data on energy consumption. Through this, in addition to electricity and gas system management, Elering is becoming an energetics smart grid administrator. Integrating energy retail markets benefits all Europeans. Energy retail markets (selling energy to homes and businesses) are fragmented in Europe by region and by country. One of the main aims of energy policy in Europe is to integrate energy markets to facilitate the energy transition and benefit consumers. The Clean Energy Package requires consumer data access. Energy meter data is necessary, in order to bill consumers. For example in Germany today it would be necessary to integrate with around 400 DSO information systems in order to be able to sell electricity across the country. This is a real barrier. Estfeed is a data access platform created by Elering that connects energy datahubs together and enables energy companies, demand response aggregators and other service providers to access data from one place. This enables retail market integration in practice. Estfeed is secure and GDPR compliant. It is a scalable, secure data access platform that ensures energy data moves only with the consent of the home or business owner. Look the video of the workshop on data access organised by Elering in December 2018 in Tallinn to European Network of Transmission System Operators RDIC commitee. The technical basis for the Elering smart grid platform is the Estfeed data exchange layer. Through Estfeed, the platform can interface with various data sources and these data can be used in the applications desired. Elering invites all interested parties to join the smart grid platform. Partners may be aggregators of both energy production and consumption, as well as those collecting other connected data and application providers whose data processing creates value for other market participants. Elering has created e-elering, a client portal for the applications that uses data through Estfeed platform as well as for other smart energy usage applications. Client portal that brings together energy data, applications and e-services, as well as and management of related rights! In the portal, consumers can view their own electricity and gas consumption data and give service providers mandates to access their data. In a specially designed information system, renewable energy producers can follow production data, submit applications for renewable energy subsidies, and conduct operations for certificates of origin for renewable energy production. The information system for connections to the transmission system is also available through e-elering, and third-party solutions for following the electricity and gas prices can be accessed.